Manufactured by Accufab to CBM Motorsports™ specifications this 105mm LS throttle body is machined from a solid block 6061-T6 aircraft grade billet aluminum here in the USA. It is designed to fit GM LS2, LS3, LS7 and LSX style manifolds. Includes mounting bolts. Available in a polished or black anodized finish. Designed to fit GM LS2, LS3, LS7 and LSX style manifolds. 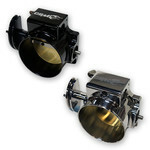 Customer Review: Bought this throttle body one season ago and is still looking/work great! Q: Will this fit the Holly High ram 105mm intake?